When ever my fam goes out to dinner we have this strange habit of trying to guess the total of the bill. It is always amusing and my father always seems to come up on top. So let's play a little game. Guess the price of Kanye's Lou V shoe. Well the rumors of $500 were...not really close. 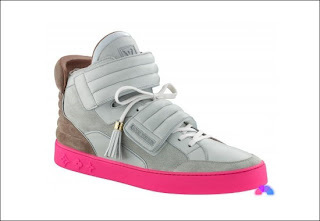 The price tag for the Kanye West x Louis Vuitton kicks were released today. 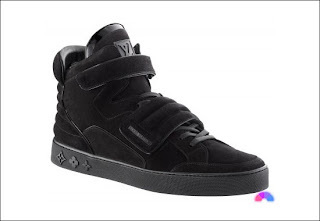 The entry level kicks, the Mr. Hudson's, are going to run you $840 USD. Those are the slips. The mid level Don's are going to run you in the neighborhood of $870 USD and the Jasper's (as seen above) $990 USD for the Blacks and $1,140 USD for the Pink accented kicks. Could there be a worse time for the release of these shoes considering the economy and for Canadians the horrible dollar. To put this in perspective for Canadians, if you can get your hands on a pair, will cost you approximately $1456 Canadian. There are 367 cars listed on Kijiji Winnipeg for under $1,456 and you can at least make an offer. Good luck dealing with Louis Vuitton. "Hi. I have $80 bucks can we make a deal?"